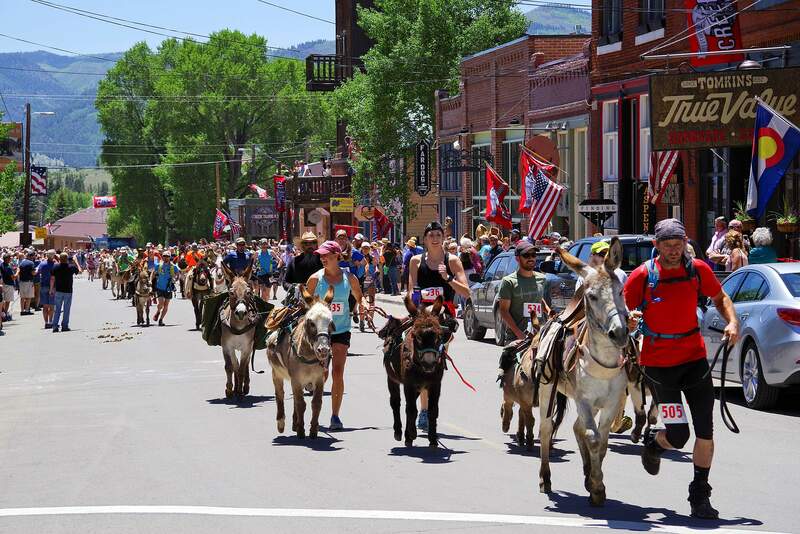 Pack burro teams head out along Main Street in June 2017 for the inaugural 10-mile Creede Donkey Dash. The race was part of the town’s 125th anniversary celebration, but it was so popular, the second annual Donkey Dash is set for June 9. John Vincent of Franktown and Crazy Horse celebrate their win at the 2017 Victor Burro Race. The team also won the short-course races last year in Fairplay and Leadville and took second place at races in Idaho Springs and Creede. The lead racers slow as they head up Second Street and turn onto Portland Avenue before making the final uphill push along Fourth Street at the 2017 Victor Burro Race. Trailing in third place is John Vincent of Franktown and Crazy Horse, who won the race with a time of 1:10:25. The animals are interchangeably called burros, donkeys or asses, with plenty of wordplay on the latter. But hey, if you run up to 29 miles and over 13,000-foot mountain passes with a burro, you’re probably entitled to a few silly puns. For those unfamiliar with Colorado’s Summer Heritage Sport, so-designated by the state Legislature in 2012, here are the basics: The burro carries a 33-pound pack that includes a miner’s pick, shovel and pan, and the human part of the team runs alongside (or sometimes in front or behind the burro, depending on how things are going), holding a lead rope. No riding is allowed. And that 33 pounds, by the way, doesn’t include water for the run because it must weigh at least 33 pounds when you return to the finish line. This summer, spectators can catch one of eight races around the state, with the season beginning May 26 in Georgetown and concluding Sept. 15 in Frederick – a new race on the circuit. Often, the races are part of larger town heritage celebrations, but even if it’s just the race, onlookers have plenty of opportunities to hear about mining and burro lore and explore the areas where the races are held. Many aficionados of the sport hike to watch the race from their favorite scenic overlooks. The courses range from about 5 miles (great for beginners) to the granddaddy of them all – a 29-mile ultra-marathon and world championship race in Fairplay. That’s also the first leg of the Triple Crown, which includes a 21-mile course in Leadville and a 13-mile course in Buena Vista. The Fairplay and Leadville long-course races include the 13,185-foot summit of Mosquito Pass, which sit between them on a rugged trail road; both towns offer shorter 15-mile courses as well. Colorado’s sportThis year marks the 70th anniversary of pack burro racing, which began in 1949 with a race from Leadville to Fairplay. The races celebrate the state’s mining heritage, and burro racing is the only sport indigenous to Colorado, Wann said. Some of that history will be on display during Fairplay’s 70th annual Burro Days, July 27-29, where a tiny house museum will showcase pack burro racing, said Shelley Hall, the WPBA historian and a burro racer. Burro Days draws thousands of people and culminates with the pack burro race on Sunday. Spectators mingle with the burro teams at the inaugural Creede Donkey Dash in June 2017. The race celebrates the area’s mining heritage, and the 10-mile course passes several mines, including Commodore and Amethyst mines. The 2017 race was won by Chris Westerman of Larkspur and Yukon Jack, with a time of 1:37:23. This year’s race is set for June 9. After the burros take off at 10:30 a.m., spectators at the starting line have about 5½ hours to take in other Burro Days events, sightsee and grab lunch, before the teams return to the finish line. You’ll have less time during the shorter races – the winner of last year’s 10-mile race in Creede finished in 1:37:23 – but there’s time before and after to take in other activities at each of the locales. 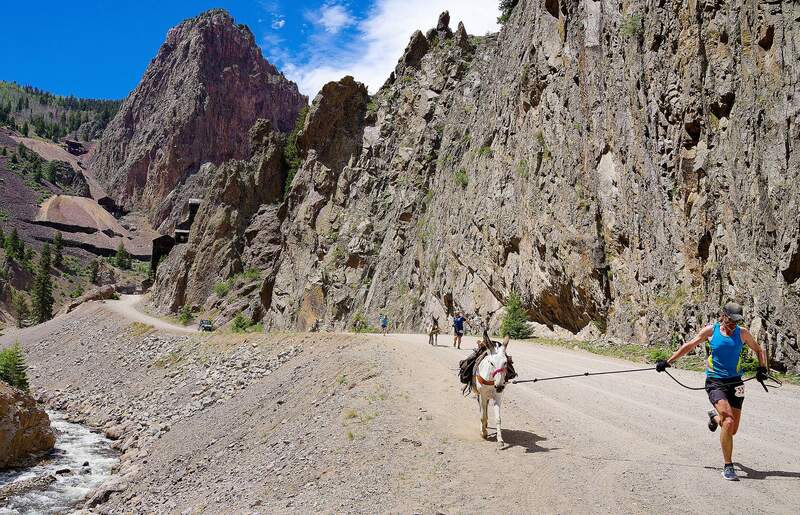 Creede joined the circuit in 2017, and will have its second event this year, said Erin Yurkinas, co-director of this year’s Donkey Dash on June 9. 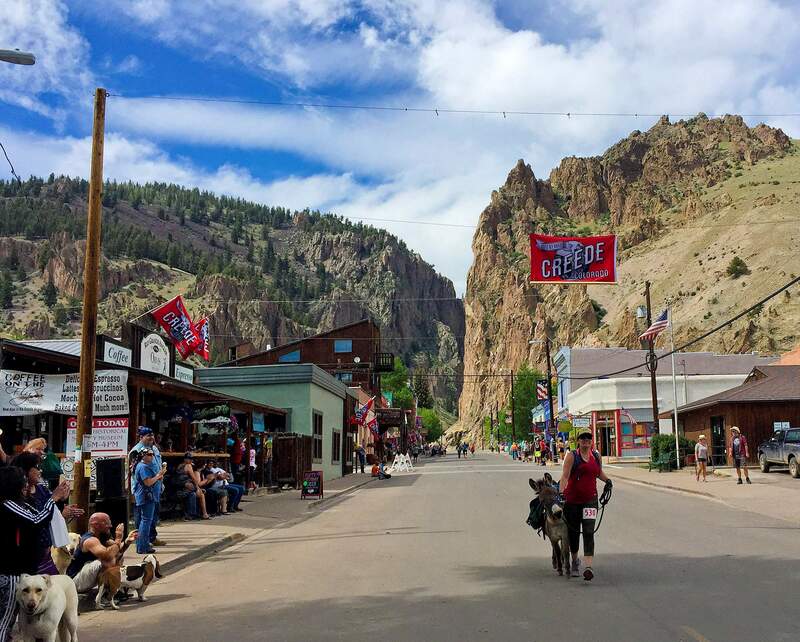 Last year was Creede’s 125th anniversary and the town wanted some special events for the celebration. Wann said the WPBA is happy to add races around the state and keep the races smaller. “It’s good to have smaller venues for people to work up to the 29-mile race,” he said, noting that the bigger races are getting crowded, and the WPBA might someday have to consider capping registrations. The association has tried to keep things simple with race-day registration, but that leaves some uncertainty in the number of racers. Human, burro dynamicsThe sport’s popularity is increasing, and he said he expects more than 70 teams to race in Fairplay this year. More racers are coming from other states, he said, and much of the attraction is because of the burros. Burro teams run along Bachelor Loop Road before heading up and over Campbell Mountain and then down to East Willow Creek during the 2017 Creede Donkey Dash. The town’s inaugural pack burro race drew 42 teams for the 10-mile course. Racers range in age from their 20s to their 70s, including some who remember when many of the racers were miners. Women have competed since 1951 and have taken the Triple Crown championship more than a few times. Some racers own their burro and others rent them, working with WPBA burro matchmaker Amber Wann. Those who don’t own burros usually try to spend some time hiking or running with them, but some have only a few hours before a race to get to know their animal partner. Hall, the association historian, has been racing since 2004 and rents her burros. “That means I have to travel to hike and train with donkeys,” she said, noting that she’d spent a recent afternoon hiking near Buena Vista with a burro. But that’s not really a hardship, she said, because she loves the animals. Hooked on racingMany of the burros are adopted through the Bureau of Land Management, and racers who want to own a burro are encouraged to adopt from the BLM. Dave Edwards, 67, of Monte Vista tends to Taz after completing the 6.62-mile course in the Victor Burro Race with a time of 1:43:28 for 10th place. It was Edwards’ – and Taz’s – first year racing, and they finished in the top third in the five races they ran. When Dave Edwards, 67, of Monte Vista adopted his burro last April, he had never heard of burro racing. He likes to camp in the backcountry and was looking for a pack animal to carry equipment. About a month after he adopted Taz, he struck up a conversation with a couple from South Fork who suggested he try racing. 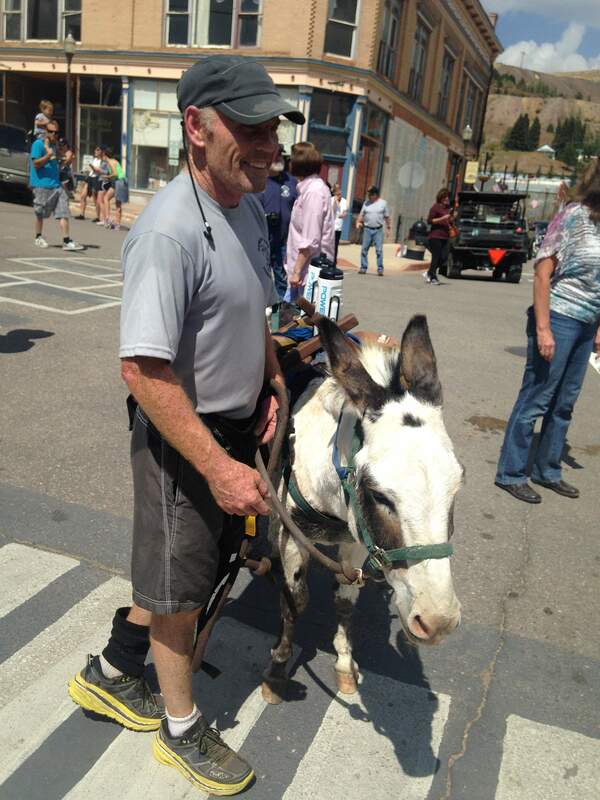 The nearby town of Creede was sponsoring its first pack burro race on June 10, so he checked it out. “I thought, this is fun. I’ve got to do this,” he said. The next race was a 6-mile course in Idaho Springs on July 23, and Edwards was there. Edwards said he’s run all his life and enjoys hiking and horseback riding in the wilderness around his ranch, but burro racing “takes the starch out of you.” Still, after the first race, he was hooked. He did the remaining four races in 2017, and plans to do most, if not all, of this year’s races. He and Taz travel to the venue the day before a race and camp near the course so Taz can relax after several hours in the trailer. Taz, he says, could probably be a champion if he had a faster human partner. ‘As fun as it looks’Jack Lohmann of Frisco also started burro racing last year at age 66 – doing all seven races, including the long courses at Fairplay and Leadville. But he had long known about the sport. “I’d been watching burro races since I was a kid,” he said, explaining that his family owned property in Frisco and he spent many a summer exploring old mining towns and the high country. He retired to Frisco in 2012 and took notice of the diversity of runners in the burro races. He was a longtime jogger and enjoyed hiking. He arranged to rent a burro for the 2017 races and participated in a few fun runs to get the hang of things. “I did all of them last year, that was my goal,” he said. “That’s my goal again this year. He ran with Doc, a burro from the Laughing Valley Ranch in Idaho Springs. Initially, Lohmann thought he’d run the shorter courses at Fairplay and Leadville, but after the first couple of races, he decided to do the long courses, and he’s glad he did. His favorite was the Fairplay race. “It’s as fun as it looks,” he said. “I’d encourage anyone interested to give it a try. 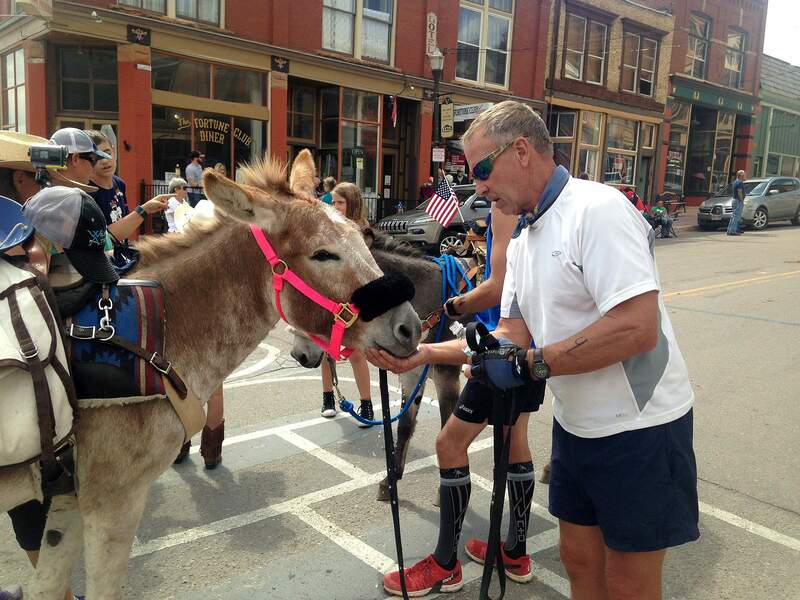 May 26 – 14th annual Historic Georgetown Railroad & Mining Days Pack Burro Race; http://bit.ly/2GIR9h7.May 27 – 17th annual Idaho Springs Mining Days Festival and Pack Burro Race; http://bit.ly/2GK0g1d. 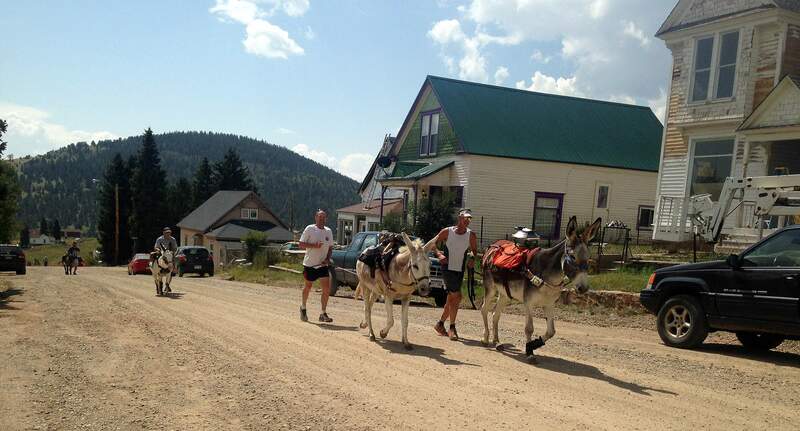 June 9 – Second annual Creede Donkey Dash; http://bit.ly/2u28G10.July 29 – 70th annual World Championship Pack Burro Race – Burro Days, Fairplay; www.burrodays.com.Aug. 5 – 70th annual Boom Days Pack Burro Race, Leadville; www.leadvilleboomdays.org.Aug. 12 – 45 years of Buena Vista Gold Rush Days Pack Burro Race; http://bit.ly/2tYx7wg.Sept. 8 – Fifth annual Victor Burro Racing Gold Rush Challenge; http://bit.ly/2DGqajc.Sept. 15 – Inaugural Frederick Miners Day Pack Burro Race; http://bit.ly/2pmkdnm. More information on pack burro racing: www.packburroracing.com. To watch a video of scenes from the inaugural 1949 race: http://bit.ly/2FTAl5L.